I typically don't like to just copy and paste a list of details about a product from the companies website however these little Mary Jane beauties are just all about goodness and a simple list suits them. The blue are my additions. Kigo is one of those rare companies who pride themselves in their practices in making shoes and all of the behind the scenes details. Sure their shoes are cute but their are brains behind the beauty!! Kigo footwear uppers, soles, lining and packaging are all crafted from recycled and post-consumer elements. That includes using textiles made from regrinding and reprocessing reclaimed consumer material and post manufacturing scrap into new raw material for our finished shoes. When you receive your shoes in the mail you will find a small recycled box and minimal amount of recycled paper wrapping. I use my shoe boxes for storage and organization of stuff on my desk. They also know the value of working from a home environment. All around I love this company! Its simple. Style and lifestyle combined. 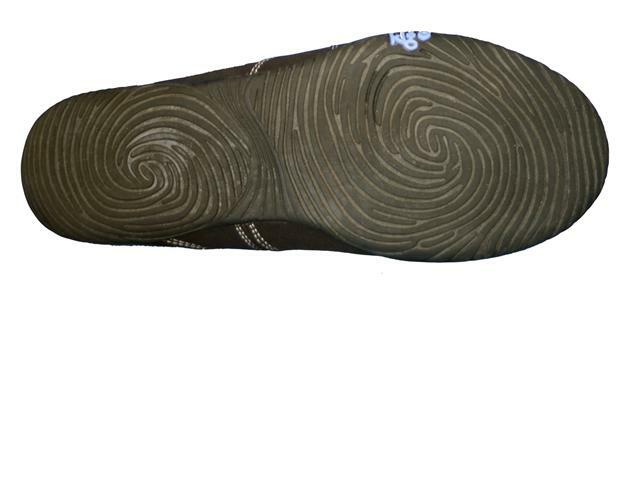 The kigo footwear insole is removable. At approximately 2mm, the insole provides a slight amount of cushioning. With the insole removed, the outsole offers superior ground feel and flexibility for those seeking a truly barefoot stride and increased space inside the shoe. So combined, the outsole and insole, are 4mm. I wear mine both with and without the insoles depending on my mood and the terrain. If I am doing a full day of walking I will make sure and take the insoles with me in my bag. Kigos are H2O & stain resistant, thanks to an EPA approved treatment that is washed into the fabric (rather than sprayed on). If they need more than a wipe-off, wash them in a gentle washer (water only!) and allow them to dry in the sunshine. See very simple. The way shoes should be. The heel tab is comfortable and I don't find that these shoes rub me the wrong way anywhere on my feet. If you have been reading my reviews previous to this one you will remember that most all shoes rub at least one spot on my foot the wrong way. At least one spot. The Flits are totally comfortable. They are much like the Curv their previous Mary Jane style model yet they just got better. I have a dear friend who also tried the Flits and shes asked me to think again and pay attention to the seam around the edge that comes in contact with the ankle. It is a bit rough to the touch with my hands however I didn't find that they rubbed on my feet so I see her point and do agree that it would be an improvement if a softer thread could be used. But like I said they didn't rub me the wrong way at all either. I love the diagonal strap across the top and you can see how flexible they are. I think its a nice change and bit of flare for a mary jane. These are great for when you need a shoe as a backup to barefoot. I love to head out barefoot but know that my flits are in my bag when I need them. They are cute enough for many settings and I do love the blue and black colors. I have worn them with a dress and also with jeans and cutoff shorts. Very versatile shoes and I plan to wear them with cute socks when it cools off a bit too. These have great traction for all kinds of terrains. I like the style of the sole as well. They would be great for lite hiking and playing down by the river ect but I don't think I could run much in them. The Drive model is more about running. Kigo Flits come in Black with light gray stitching or Gray with blue stitching and are priced at $87. This seems reasonable to me considering how adorable and yet functional they are and all that goes into the eco practices of the company. The Curv model used to have a 1.5 mm heel toe drop which was imperceptible however the flits now have a zero heel to differential. I am sure that my movement part of my brain can tell the difference even if my conscious mind can not. These have all of the points I like to see in a minimal shoe. Well done Kigo! Just for reference I thought I would include the Kigo Curv Review back in March of this year. Seriously adorable! LOVE that diagonal strap—takes the usual Mary Jane style a step beyond. And the thumbprint sole is one of those surprise hidden features that can make me pull the credit card trigger. I've been looking forward to your review of these shoes. So cute! I love those! they look so incredibly comfortable!! Gotta remember it next time I need shoes! Those shoes look awesome! They are super cute too! Seriously adorbs!! I am going to keep these in mind!